Join us for the Ultimate Falcon Pageant this Friday evening at 7:00pm in the Elmira High School main gym. 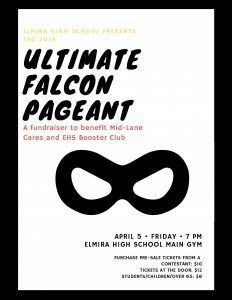 Ultimate Falcon is a fundraiser that benefits both Mid-Lane Cares and the Elmira High School Booster Club. Tickets can be purchased from any Ultimate Falcon competitor for $10 or you can purchase a ticket at the door for $12. Tickets for students, children and over 65 are $8 each.